Enjoy a film the way it was meant to be! The first film screening in New Zealand was held at the Opera House in 1896. Since then, movie theatres have evolved from small rooms in the back of shops to include extensive multiplexes, drive in outdoor cinemas, and massive IMAX theatres. Is a movie theatre a good option for your kids? Going to the movies is a popular family activity. With a huge number of different films to choose from and a movie theatre located in almost every suburb, seeing a movie is a fun and convenient form of entertainment. On any given day there will be a movie option to suit all ages, and movies can have great educational benefits too. Open air cinemas - definitely a great summer activity! These specialty cinemas tend to cost a bit more than regular movie theatres. You might like to keep them in mind for special occasions, such as kids' birthday party ideas. Many specialty cinemas often screen exclusive documentaries, animated films, and series that aren't available at regular theatres. It can be difficult to take toddlers and babies to the cinema, but many theatres offer special "mums and bubs" sessions during the day for parents to bring their very young children without having to worry about disturbing other patrons. Keep in mind that younger or more sensitive children may find 3D films and huge screens overwhelming. Movies are rated according to their content - check out the classification to make sure the movie you choose is suitable for your children. A movie theatre generally has a kiosk where you can purchase food and drinks, including popcorn, lollies and ice cream. Some upmarket venues have special premium areas where you can buy light meals. Other kids' activities can often be found in movie theatre complexes including video arcades, bowling alleys, and sometimes even ice skating rinks. Many cinemas are located in shopping malls, making them very convenient for parking and eating. Most major theatres are open all year round although a smaller movie theatre may have limited hours of operation so it is a good idea to check first and make a booking, particularly on public holidays. You can find a list of films and show times online or displayed in the foyer of the cinema. 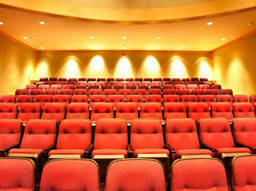 You can find movie theatre contact details in the ActiveActivities directory. Movie tickets usually cost around $14 for adults and less for children. Most major cinemas offer family discounts. Keep in mind you are not usually allowed to take outside food and drink into the theatre, and food sold at the venue is pretty expensive. Now all that's left to decide is which film your family wants to see and whether you want to treat your loved ones to one of the special screens. Happy viewing!